Posted January 13, 2016 by Jacqueline Hogge, The Tuam Herald in News. 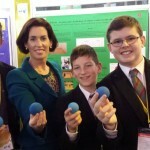 A Claregalway school is celebrating this week after two of its students scooped one of the top awards at this year’s BT Young Science Exhibition. 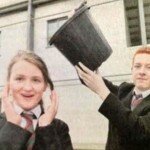 In what was a double success for Coláiste Bhaile Chláir, Alaidh Fox from Corofin and Deirdre Hughes from Annaghdown were honoured for a device they have developed to help blind or visually impaired people navigate everyday life. In the Top Six! 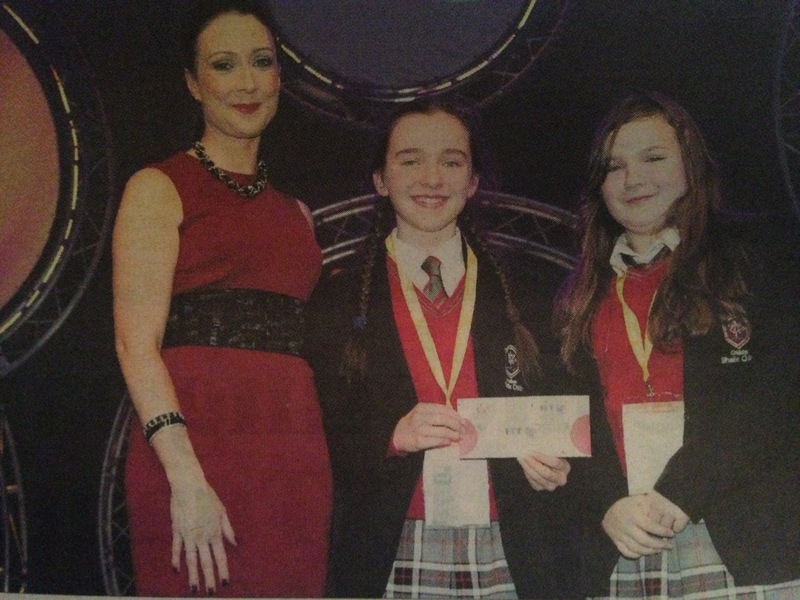 Deirdre Hughes and Alaidh Fox from Colaiste Bhaile Chlair, Claregalway, won multiple awards at the BT Young Scientist Exhibition in Dublin over the weekend for their project Sensor Guide. 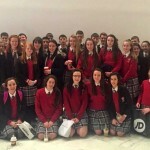 They are pictured with Ruth Murphy, Chief Legal Counsel for BT in Ireland. Their fellow second year students Ella Rose McIntyre and Roisin Cellarius also collected first prize in the Junior Group section of the Social and Behavioural Sciences category with their project examining the effects of wearing high heels. Roisin Cellarius and Ella Rose McIntyre from Colaiste Bhaile Chlair, Claregalway, with the plaque and rosette which they won by claiming first prize in the Junior Section of the Social and Behavioural Sciences category of this year’s BT Young Scientist Exhibition. 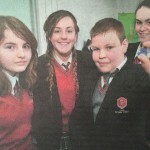 They are pictured with their teacher, Eleanor Nolan. As winners of the Analog Devices Best Technology Award, Alaidh and Deirdre will now travel to California later this year, in recognition of their sensor which is essentially a smart cane for visually impaired people. Their device comprises of two prototype white canes with sensors and functions which they have spent the past six months developing after getting feedback from white cane users and the National Council for the Blind in Ireland. They have also developed a glove which has a built in motor that vibrates if it detects the presence of something within 30cm. 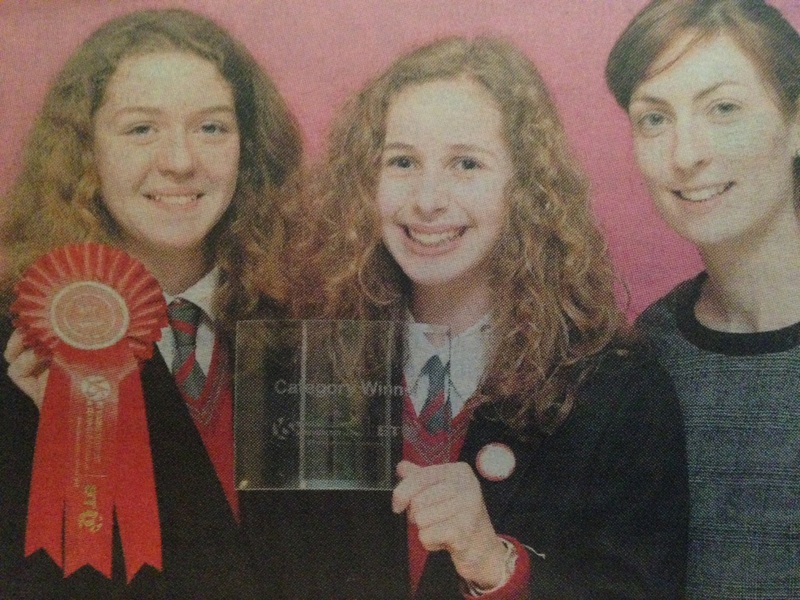 The girls also won a perpetual trophy for the school, along with 2,500 to invest in scientific equipment as part of the award which was one of three they won in the competition overall. Taking second place in their group section earned them a prize of 225 while they also won the Google Creative Technology Award. Teacher Eleanor Nolan praised all four students for the work they had put into their projects and for being wonderful ambassadors for the school. “All four girls have worked incredibly hard on their projects which they presented so well to the judges during the competition, and their awards are richly deserved,” she said. “We are especially thrilled for Alaidh and Deirdre whose Analog Award is one of the top six prizes in the competition and is awarded to the students who demonstrate the best concept for use of technology. 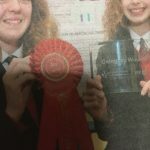 “The school is only open three years yet we have contested the past three BT Young Scientist Exhibitions and have won prizes each year, so it’s a wonderful achievement for all the students involved and we are very, very proud of them. Alaidh and Deirdre will travel to the US later this year with their parents to visit the Analog Devices headquarters to meet with engineers who develop new technology. Principal Alan Mongey paid tribute to the girls and their teacher for what he described as a wonderful achievement. Speaking at the school on Monday, Ella Rose and Roisin said they had a fantastic experience and were delighted with their award which included a plaque and €300. “The judges praised our communication and presentation skills and we ended up having two judging sessions, where most groups only had one,” said Ella Rose.